I did not find this story to make much sense at times and it seemed like a few holes were occurring. I had a hard time focusing on it. 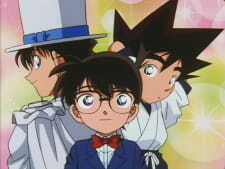 The art and music were nice and typical of and Detective Conan episode. The characters were well done and thought out. I did like the humor of them. From the tiny grandmother to Yaiba but I am not sure I would want to see them in another OVA. While I love Detective Conan I was not overly thrilled with this OVA. The story just seemed too weak for me. Overall it was nice for a one time watch. Detective Conan OVA - When to watch them?